Combustion is often a rapid process, as in the case of fire. How can cells control the burning process so well? The question has long puzzled researchers. 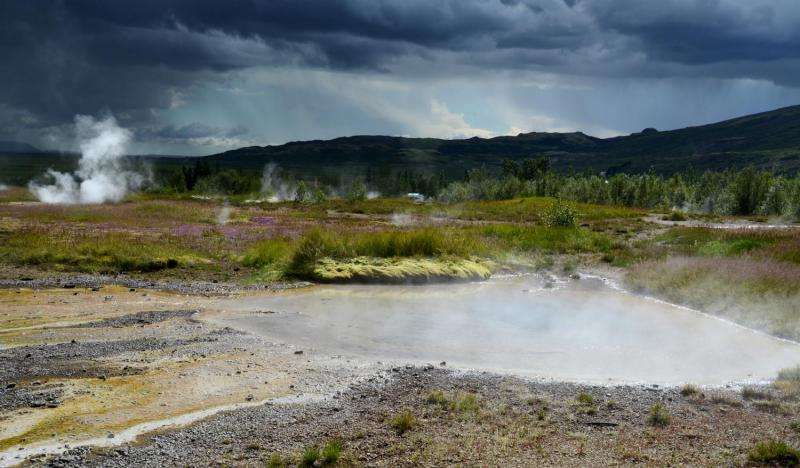 Using bacteria from hot springs, researchers from Stockholm University now have the answer. When cells burn fat, sugar or protein containing the same amount of energy, they do not vanish into fire and smoke, but use the energy to activate muscles. How does the body control the burning process so well? Researchers at Stockholm University have finally been able to monitor the process and to uncover the mechanism. The combustion of oxygen in our cells takes place in the so-called respiratory chain, which carefully controls the process. Electrons, which come from digestion, are transferred to the oxygen we breathe. The oxygen molecules bind to an enzyme in our mitochondria, the cellular power plant. However, the bound oxygen is not immediately combusted to form water, as in an uncontrolled fire, but is converted to water gradually in a carefully controlled process. Up until now, we only had a very basic knowledge about the mechanism of this process, since the reaction is too rapid to be studied using available techniques. One possibility would be to follow the reactions at low temperatures, at about -50 degrees Celsius, where they would be sufficiently slow. However, this is not practically possible. In this project, researchers Federica Poiana and Christoph von Ballmoos studied oxygen combustion in a bacterium that lives in hot springs – they thrive in nearly boiling water. When the research group performed their studies at 10 degrees, the bacteria found it extremely cold – comparable to human mitochondria exposed to -40 degrees. The reactions were sufficiently slow to allow studies using available instruments. By combining their experimental studies with theoretical calculations, the researchers could translate their observations to the equivalent processes in human cells. "In addition to just being curious and wanting learn how the process works, our studies are also motivated by trying to understand mitochondrial diseases caused by malfunction in oxygen combustion," says Peter Brzezinski. JUST DON'T SWEAT! Take E.Coli. Look At Genome of Hot Spring Bacterium. Take 26 Bases from that Genome Sequentially and Stick Them into E.coli, one after the other until ALL bases are gone. See What Happens! As Simple As Possible TO START THE RESEARCH ! Then, Decrease OR Increase the no. of bases transferred as you want !